I hope you all had a wonderful weekend. We celebrated my husband’s birthday by spending some time window shopping, trying out a new restaurant and savoring some gelato. One of the places we went to was Sur La Table. If you love to cook this is the place for you. I don’t cook but my husband enjoys it (thank goodness) so we browsed in there quite a bit. 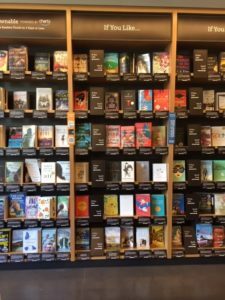 We also went to an Amazon Books retail store. It was fun to look at the new Kindles and to see how the store is laid out but this reminds me of an airport bookstore. A limited selection of bestsellers, some magazines and a few other bits. No comfy chairs anywhere. We did get a cookbook, Simply Vegetarian Cookbook, and hopefully will enjoy a new dish next weekend. So not a lot of reading was done over the weekend although I did finish Disappearance at Devil’s Rock by Paul Tremblay. I am not sure how I feel about this book. There were some good suspenseful elements but in the end I was left feeling sad and lacking closure. I do recommend it though if you are looking for a good R.I.P. read. I’ll try to write a bit more about that one soon but let me know if you’ve read it and what you thought. Now to get busy on my book group read as I need to make sure I finish that in time before next week. I don’t love when a book lacks closure at the end. But that kind of ambiguous ending seems to be more and more common these days. Happy birthday to your husband! I haven’t read Disappearance at Devil’s Rock, but it’s on my TBR pile. Endings like that can leave me disappointed, but sometimes it depends on the book. I hope you are enjoying your week! Lark – I would say more but don’t want to spoil the ending. I’ve been thinking about this book for a couple of days and overall I did like it a lot. Literary Feline – Thank you! I give the book a thumbs up so I hope you’ll enjoy it when you get around to it. Would be a great book for this time of the year! I just got my new Kindle yesterday, but from the online Amazon, not a brick and mortar. My Kindle was behaving strangely, taking forever to load, and making me worry that it was going to go completely blank. I never would have believed just how dependent I would become on an ebook reader! Sounds like your husband had a good birthday, Iliana!